I have so many pairs of shoes it’s not even funny. At least I do. Hee Hee! I’m only showing you two pairs of boots I have. Thrift store find… Woo Hoo! I thought I would show you how my photo session went. I forgot to do my photos for the challenge so I rolled up my yoga pants yesterday and thought I would take a few pictures of my shoes really quick. Jack O lanterns we still had on the porch on my head while I’m taking photos. Plus she wouldn’t stay out of the picture. I even tried to bribe her with candy. What am I suppose to do with that? To help me stay sane and not lose it I tend to make weird faces so the kids laugh which then makes me laugh too. Why didn’t anyone tell me this? I don’t know if you could technically even call them shoes.. Some rubber and two straps is really all they are… But I love them! 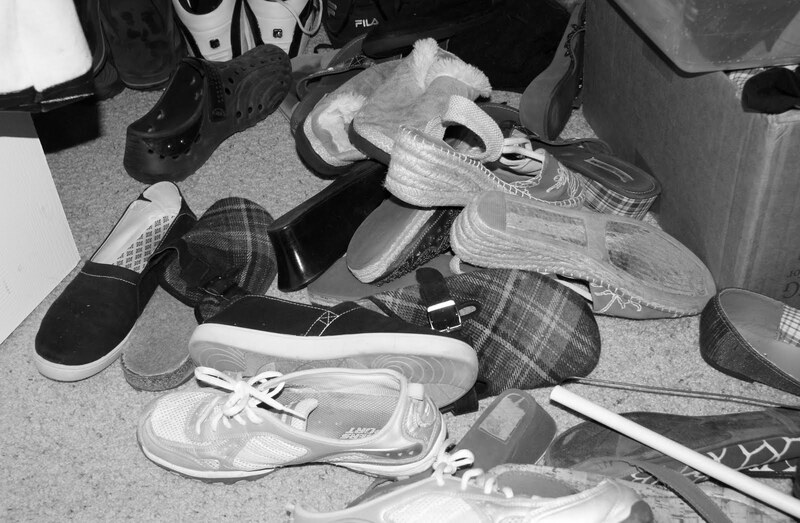 This is just a peek at 1/4 of my shoes that are in the closet. I’m so messy and unorganized. Clean up your closet girl! You're hilarious. I love boots too and yours and spectacular. I can't believe that second pair was a thrift find. Nice going. another shoe-aholic here!!! love your boots – they're so versatile aren't they? love those shots too – esp. you on the floor with your daughter!!! i love how our kids interrupt our shoots! I love your boots and I love that first shot! What a fun picture!